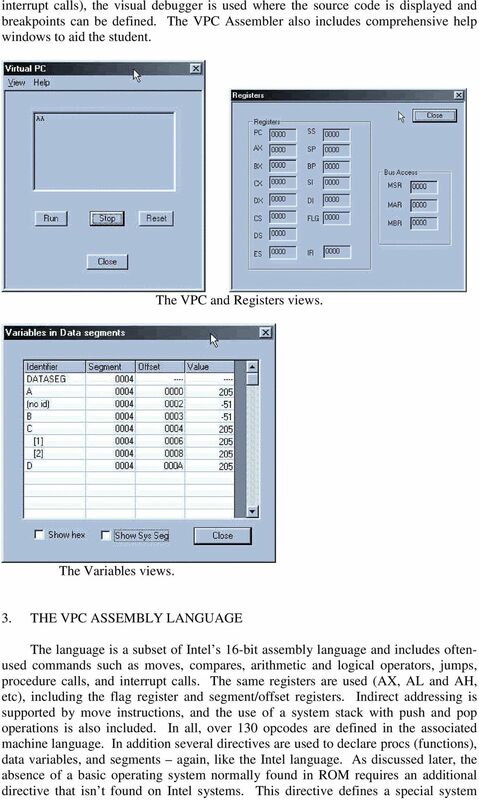 Download "ASSEMBLY PROGRAMMING ON A VIRTUAL COMPUTER"
1 ASSEMBLY PROGRAMMING ON A VIRTUAL COMPUTER Pierre A. von Kaenel Mathematics and Computer Science Department Skidmore College Saratoga Springs, NY (518) ABSTRACT This paper introduces the VPC Assembler, a Windows 95/98 assembly programming environment that targets the Virtual PC, a simulator of a small computer system based on the Intel 8086 architecture . The assembler provides an editor, a debugger, and views of the assembly program s variables, the CPU s registers, and the Virtual PC s output. 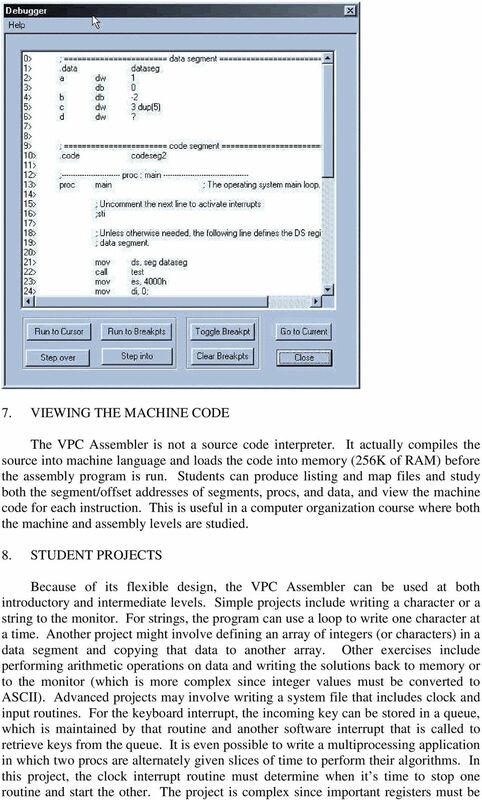 The VPC Assembler was designed as a learning tool for courses that introduce assembly programming or for courses, such as computer architecture or organization, that briefly cover the fundamentals of assembly. 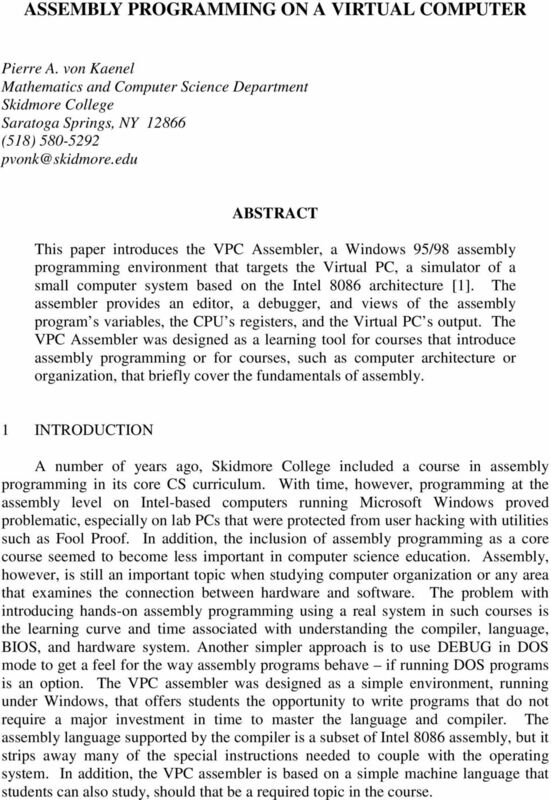 1 INTRODUCTION A number of years ago, Skidmore College included a course in assembly programming in its core CS curriculum. With time, however, programming at the assembly level on Intel-based computers running Microsoft Windows proved problematic, especially on lab PCs that were protected from user hacking with utilities such as Fool Proof. 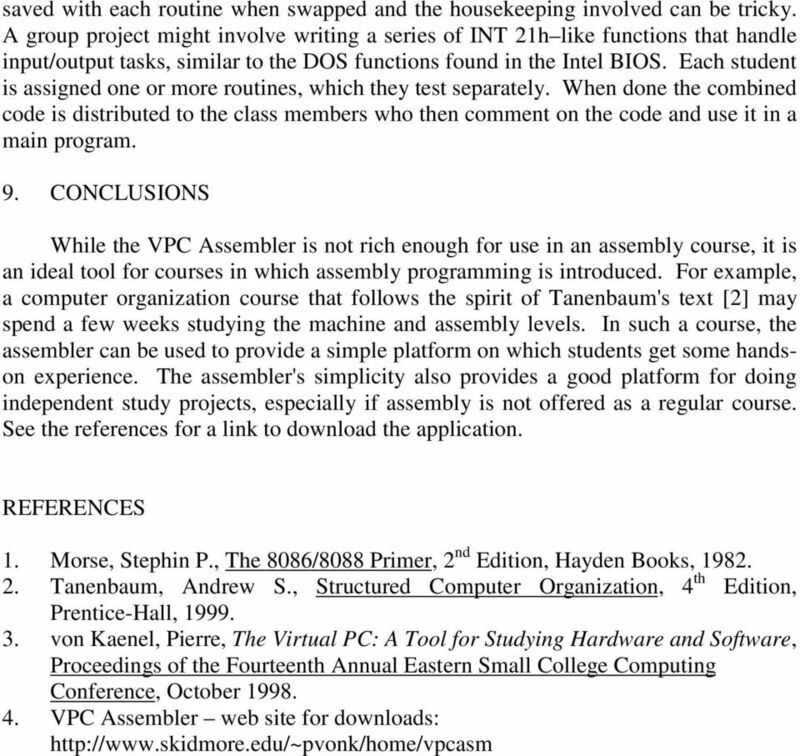 In addition, the inclusion of assembly programming as a core course seemed to become less important in computer science education. 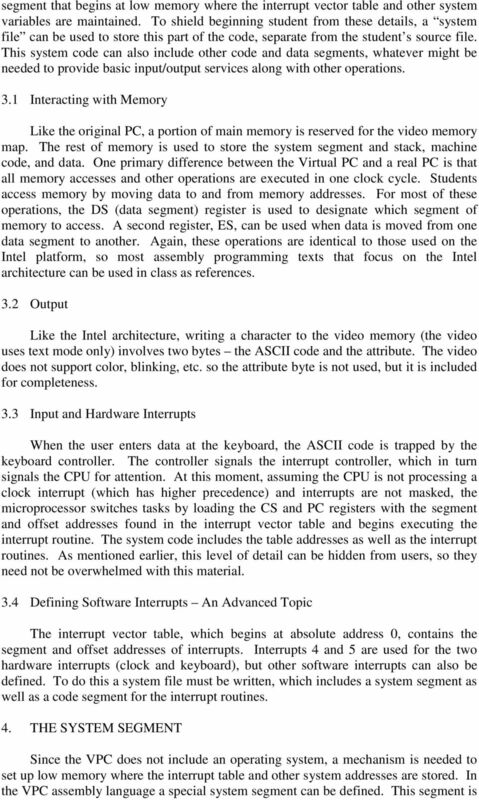 Assembly, however, is still an important topic when studying computer organization or any area that examines the connection between hardware and software. The problem with introducing hands-on assembly programming using a real system in such courses is the learning curve and time associated with understanding the compiler, language, BIOS, and hardware system. Another simpler approach is to use DEBUG in DOS mode to get a feel for the way assembly programs behave if running DOS programs is an option. The VPC assembler was designed as a simple environment, running under Windows, that offers students the opportunity to write programs that do not require a major investment in time to master the language and compiler. The assembly language supported by the compiler is a subset of Intel 8086 assembly, but it strips away many of the special instructions needed to couple with the operating system. 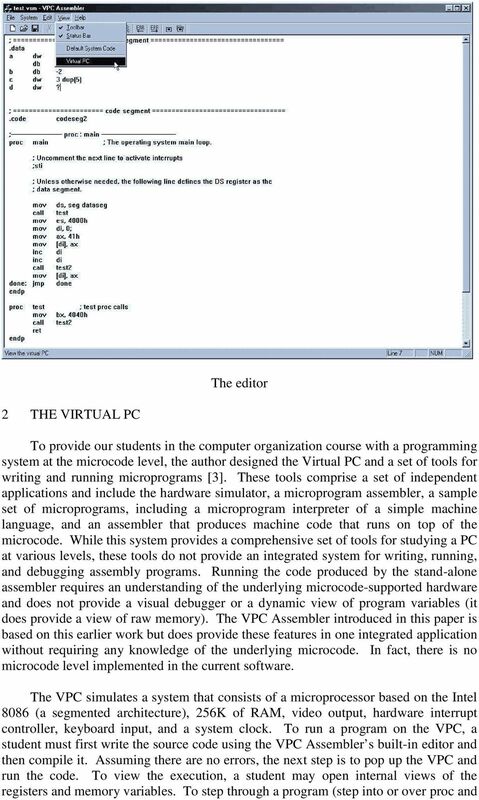 In addition, the VPC assembler is based on a simple machine language that students can also study, should that be a required topic in the course. 5 nothing more than a data segment that maps to low memory. An example of two entries in this segment follows: dw seg _int4 ; segment address of int 4 dw offset _int4 ; offset address of int 4 These statements define two 16-bit words; one whose value is the segment address of a proc named _int4 and the other is its offset. Assuming these statements appear at offsets 10h-13h within the segment (the table entry for an interrupt 4 the clock interrupt), then a hardware interrupt 4 would trigger the _int4 proc. Another important entry in this system segment at offsets 20h-23h is the address of the first proc to be executed when the VPC begins running. 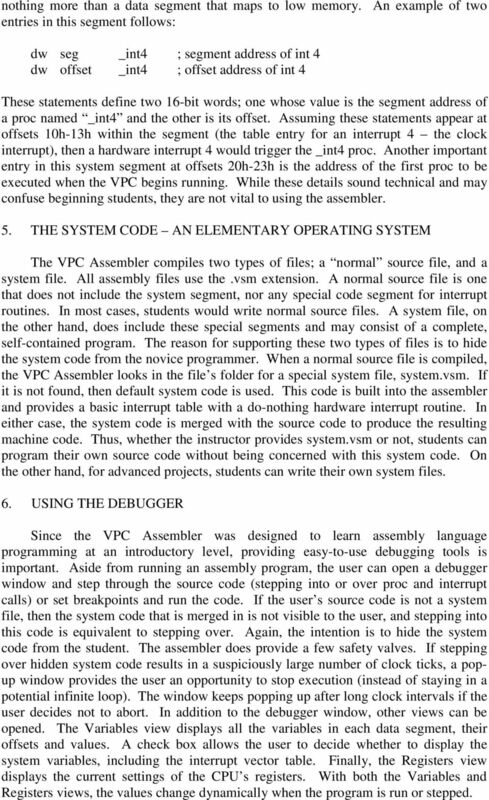 While these details sound technical and may confuse beginning students, they are not vital to using the assembler. 5. THE SYSTEM CODE AN ELEMENTARY OPERATING SYSTEM The VPC Assembler compiles two types of files; a normal source file, and a system file. All assembly files use the.vsm extension. A normal source file is one that does not include the system segment, nor any special code segment for interrupt routines. In most cases, students would write normal source files. A system file, on the other hand, does include these special segments and may consist of a complete, self-contained program. The reason for supporting these two types of files is to hide the system code from the novice programmer. When a normal source file is compiled, the VPC Assembler looks in the file s folder for a special system file, system.vsm. If it is not found, then default system code is used. This code is built into the assembler and provides a basic interrupt table with a do-nothing hardware interrupt routine. In either case, the system code is merged with the source code to produce the resulting machine code. Thus, whether the instructor provides system.vsm or not, students can program their own source code without being concerned with this system code. On the other hand, for advanced projects, students can write their own system files. 6. USING THE DEBUGGER Since the VPC Assembler was designed to learn assembly language programming at an introductory level, providing easy-to-use debugging tools is important. Aside from running an assembly program, the user can open a debugger window and step through the source code (stepping into or over proc and interrupt calls) or set breakpoints and run the code. If the user s source code is not a system file, then the system code that is merged in is not visible to the user, and stepping into this code is equivalent to stepping over. Again, the intention is to hide the system code from the student. The assembler does provide a few safety valves. If stepping over hidden system code results in a suspiciously large number of clock ticks, a popup window provides the user an opportunity to stop execution (instead of staying in a potential infinite loop). The window keeps popping up after long clock intervals if the user decides not to abort. In addition to the debugger window, other views can be opened. The Variables view displays all the variables in each data segment, their offsets and values. A check box allows the user to decide whether to display the system variables, including the interrupt vector table. Finally, the Registers view displays the current settings of the CPU s registers. With both the Variables and Registers views, the values change dynamically when the program is run or stepped. Computer Organization and Architecture Low Level Programming Physical Communication Mechanisms What Language Does a Computer Speak? Why study the Alpha (assembly)? Assembly language programs are made up of statements. Each statement may be composed of constants, literals, names, mnemonics, operands, and comments.